… EDUCATION FOR PEACE ..
As critical negotiations over the Iranian nuclear program begin this month, an American jazz ensemble, Animation, just finished a jubilant 10-day tour in Iran, arranged by Search. The band made history as the first American musicians to play in Iran’s premier concert hall in over 35 years. Cellphone photo taken from stage by Bob Beldon, leader of Animation, while playing in Iran. 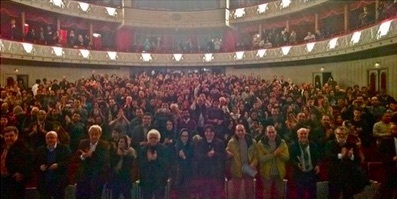 The Iranian people showed overwhelming support and enthusiasm for the musicians. After decades of hostility between the two governments, how can Iranians and Americans share such warmth? Animation’s tour is the most recent in a series of cultural, religious, and scientific exchanges our Track II diplomacy team has organized between Iran and the U.S. When most people think of diplomacy, they think of Track I – official talks between governments. Track II – unofficial contact – can provide an important foundation for official diplomatic success. Back in 1996, we gathered a team of Iranians and Americans – influential, non-governmental actors, including former high-level officials – to build trust and increase communication between the two countries. Even during the most difficult years, these unofficial efforts have continued. We’ve supported the nuclear negotiations for over a decade. But people often make the mistake of thinking that conflicts are resolved mainly through the calculated steps of rational thinkers. We know from neuroscience and from 30+ years of practical peacebuilding that emotional experiences are pivotal in decision-making. They make a lasting impact on people’s worldviews. “The impact of this series of meetings hosted by Search on my life has been tremendous. Not only have they changed my views, but I’ve chosen a different path in my life because of it…. I now have a totally different understanding of Americans.” – Iranian participant. Lack of human interactions between Americans and Iranians greatly contributed to the decades of mistrust and misperception between them. At this critical moment in U.S.-Iran relations, a jazz performance offers hope for the future. • Check out The New York Times article about our jazz tour in Iran. • Learn more about our Track II work across the Middle East, North Africa, and the U.S. Does Persian culture contribute to a culture of peace? In response to the question, “Does Persian culture contribute to a culture of peace,” today, I have a simple question of you. Try to imagine a woven piece of “Gold” with its warps and woofs made of cotton and fuzz while its various forming colors resemble a heavenward garden full of wonderful trees, flowers and plants! In my view, the question is too ordinary to be answered! Any wise man will instantly find it out that “carpet” is the keyword; a loom-woven, felted textile that is being used to cover the floor of halls, rooms and mostly to decorate walls, roofs and palms in favor of those who love elegance, dainty and grace. But what do you know about the origin of this apparently worthless rug that never attracts anyone and slightly thrown off under your feet being trampled thousands of times each day by you and your family members? Carpet’s origin of foundation is Iran and its history of production dates back to about 5th century BC when the Achaemenidan Empire was ruling. The oldest documented carpet of the world is called Pazyryk that has been woven by the order of Cyrus the great in 500 BC in the southern Iranian city of Shiraz and still survives, archaeologists say. Persian culture since the beginning of its perfection during the 600s BC until today is totally associated with some distinguished arts such as miniature, calligraphy and carpet weaving, so we can claim that these precious arts are considered as the symbols of Persian civilization, in fact. To the other words, Most of the people who don’t have much information about Iran and its luminous history are closely familiar with the outputs of Persian culture such as its performing and decorative arts. Carpets are some applicable proofs for the claim that Persian productions are widely being used throughout the world regardless to their nationality. Saffron and tea are also in the same conditions while originated from Iran but the majority of their international users do not know about the birthplace of these treasure floras. However we have to keep in mind that Iran is a cradle of carpets and rugs production. The world’s most professional masters of carpet-weaving are currently working inside traditional looms and workshops of Persian ancient cities such as Kashan, Tabriz, Yazd, Isfahan and Qom and their powerful hands manipulating wools, silk, cotton, chords and yarns to finally ensue the dazzling results that we spread under our feet unconcernedly. The carpets of highest quality are often woven by hand whereas machine-made carpets gain less quality, credibility and artistic value, so the most people try to pay more so as to buy the hand-woven carpets. It is necessary to add that the average of time needed for a beautiful illustrated carpet to come out (by hand) is approximately 400 hours and it undoubtedly shows the pure struggles of painstaking weavers who form the carpet knots with their sense of responsibility, love and talent. Carpets are the most popular souvenirs in Persia and families who want to dispatch gifts to their relatives outside Iran will always choose small-sized tufted or needlefelt carpets with fantastic warp and weft threads which shape spectacular sights of natural and ancient scenes. The most-used designs for carpets are consisted of abstract natural landscapes ornamented by warm and almost red-spectrum colors. The dominant equipment used for carpet weaving process are still the traditional instruments of past centuries such as spun and spindles.